The Look & Feel Of A Bed Selling For Thousands More - FOR LESS... MUCH LESS! Superior Comfort Memory-Touch Quality - A Heavier, Higher Density Memory-Cell® That Accepts Your Body Impression Quicker & Cradles Your Head, Neck and Back For Pressure-Free, Natural Body Alignment and Comfort. High-Density Memory-Cell® - Absorbs Energy and Motion So You & Your Partner Sleep In Complete Undisturbed Peaceful Sleep. Sleep Deeper, Sleep Peacefully Like Never Before! A European Hypo-Allergenic Breathe-Easy Stretch Knit Cover. Enhanced Pressure-Relief - "Not Too Hard, Not Too Soft" Level of Support. Takes More Time To Bounce Back - Doesn't "Push" Back When Sleeping. No Pressure Means More Comfort! Matching split foundations available - makes them easy to move! 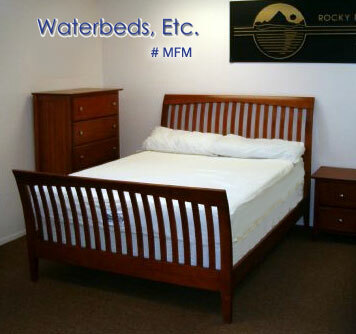 Featuring premium continental design, masonite tops and all wood construction. A Luxurious Brown Suede, Removable Diamond Quilted Cover. The magic of the self adjusting Memory Cell creates the ultimate in sleeping comfort by reducing the unwanted pressure and improving circulation for a deeper more restful slumber. The 9" Ultra-Pedic really measures up to the "As Seem on TV" brands in every way except for the high price! (Click here to Compare Ultrapedic vs. "As seen on TV Brand) From the high density foundation layer and the high resilient comfort support core to the luxuriously sculpted Memory Cell and the cotton velour-like plush cover, the Ultra-Pedic has captured the hearts and backs of America! Backed by manufacturer's full 10 year warranty, and 20 year limited warranty. The new self-adjusting Memory Cell sleep system creates the ultimate custom tailored sleep surface for correct orthopedic spinal alignment, additionally reducing tossing and turning and promoting increased blood flow. These memory foam mattresses offer new Memory Cell design adjusts to your body's weight, senses your temperature, and then it literally "memorizes" your body's shape for even better pressure free support! This revolutionary space-aged material was originally developed for NASA, who needed a material that would relieve the pressure experienced by the astronauts during lift-off. This material senses and responds to your body's weight temperature and actually conforms to the exact shape for your body, leading to a much more sound and comfortable night of sleep! Welcome to the new century in intelligent comfort in memory foam mattresses! Genuine 5 lb. Memory-Cell® Formulation. Memory-Cell® - Body, Shape & Temperature Resonsive Material. Waffle Cut Design For Flo-Thru Temperature Control. Ultra-Form Center High Resilient Core for Superior Spinal Alignment. Health Smart™ & Earth-Friendly™ Natural Organic Cotton Top - For A Breathe-Easy, Hypoallergenic Sleep Environment. "Go Green" Sage Faux Suede Panels. Adjustable Power Beds - precision engineering & advanced technology offers a great night’s sleep - yet offers so much more! Unlimited variable positions of the head & foot sections are ideal for activities such as reading, watching TV, medical related issues or just plain relaxing! California King - 72" x 84" $ 1,499. Eastern King - 76" x 80" $ 1,499. Eastern Queen - 60" x 80" $ 1,399. Regular - 54" x 75" $ 1,379. Twin - 38" x 75" $ 1,299. Extra Long Twin - 38" x 80" $ 1,319. Ultra-Pedic versus the "As Seen On TV Brand"
Compare Features and Decide which is a better value! 3 1/4" center core 2.5 resilient foam gives best body conformity and back support. None. Relies on standard foam. Quality 5.0 density Memory-Cell is softer giving lower pressure points. Advanced technology of sculpted top surface allows air movement to sleep cooler for more comfort. 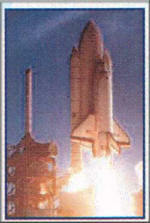 Temperature-Sensitive Material, Dust-Mite Free and Hypoallergenc, Original formulation developed for NASA. 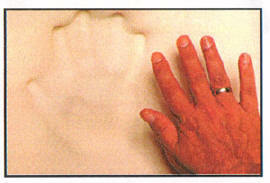 NASA Approved Tempur-Sensitive Material, Dust Mite Free, Hypoallergenci. 3 layer system provides progressive support with optimum pressure relief. 2 layer bonded - Swedish Foam glued over convoluted conventional foam. Washable cotton velour plush cover is sanitary and completely breathable. Non-quilted, non-filled cover is laminated with polyurethane. Breath-ability airflow is minimal, allowing heat to build up which may result in a hotter sleep. Made in USA, lower distribution costs. Imported. High Shipping, import, duty, and distribution costs which are passed along to you! Approximately 1/2 the price - you don't pay for the high cost of national celebrity advertising. 10 year full, 20 year limited warranty backed by a 29 year old company. 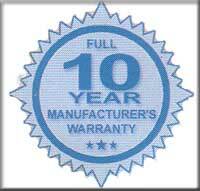 10 year full, 20 year limited warranty backed by 14 year old company.